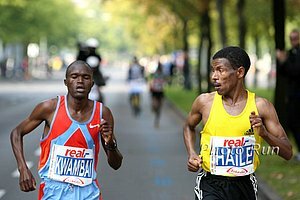 "Hermens (Haile's agent) also suggested that Gebrselassie's emotional decision to retire might have stemmed in part from political pressure he was feeling in Ethiopia. His phone has been tapped by government officials and he has faced some sort of blackmail attempt, Hermens said of his client." - Jeré Longman in the NYTimes writing about political pressure on Haile Gebrselassie and his decision to unretire. Taking on Paul Tergat is one thing; publicly taking on the Ethiopian government is another. We guess it's game on. What articles of clothing make you think the person wearing them is a moron?